My interest in woodworking goes back to my young days when I helped my father on the farm. Althought I was not able to spend time satisfying my curiosity of this medium, until many years later I never got over being attracted to the look of handmade furniture and intrigued about the process used to construct those items. Later, I was able to acquire tools and dabble in executing some of my ideas, but I was still limited on time and space; being a father to two daughters and deeply immersed in the corporate world. I was able to retire and move to Lincoln in 2007. We purchased a home with a detached shop on an acerage and I was able to devote more time and equipment to woodworking. My interests in the early years of retirement were confined to building furniture, principally for my daughters and grandchildren. 2014 saw me become interested in make end-grain cutting boards. I found these to very interesting and it was facinating to see the final products after cutting and fitting together all the components of an end-grain board. It became a challenge to devolpe more complex designs and meeting the exacting requirements of the precision that is needed to complete an intraquiet design. After making many cutting boards and giving them as gifts to family and friends, by family convinced me that I should share them with others and that would be a market for these pieces of “kitchen art”. 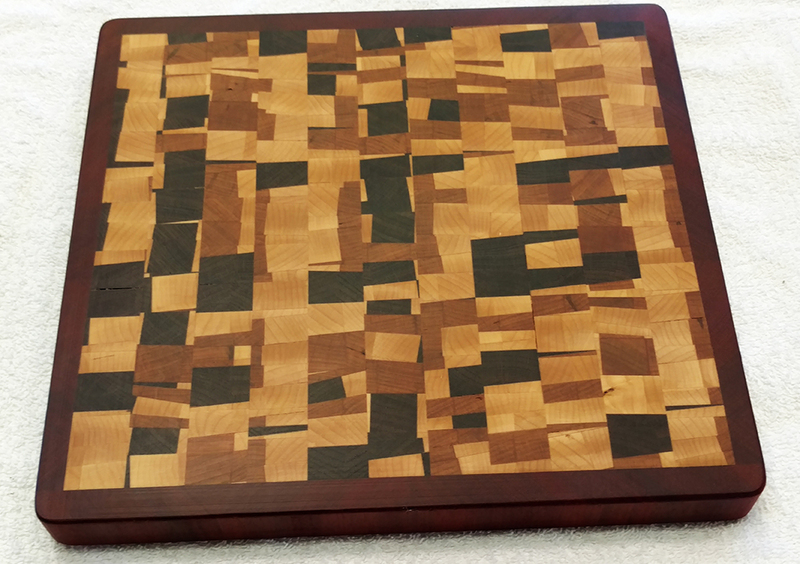 In 2015 I formed The Kustom Woodshop and began marketing end-grain cutting boards. In 2015 I attended trade shows at Millard West High School, in Millard, NE, the craft fair at the Quilt Museum in Lincoln and the December Craftacular in Lincoln. The feedback from these shows was very positive and encouraged me to continue making the end-grain boards and to expand the complexity of the design and construction. I anticipate doing more shows and exhibits in the future.